The Royal Automobile Club of Victoria (RACV) promotes, in a new commercial, its Home Insurance, which allows its members to choose cover for accidental damage. “RACV Home Insurance, you can choose cover accidental damage. 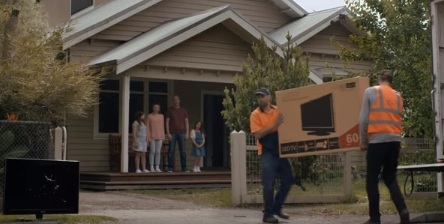 Because we know better than anyone that accidents happen.” – the voiceover says in the 15-second spot, titled “Accidental Damage”, featuring a father and his three daughters on the porch, watching as two delivery guys are bringing in a new TV to replace the one they had, which is now in front of the gate, with its display broken. Judging by the look on the man’s face, one of the kids was responsible for the replacement, but now they are all following the guys inside, with smiles on their faces. The commercial, featuring the 2014 single “The Heart” by Needtobreathe, from their fifth studio album “Rivers in the Wasteland”, released in 2014, ends with the voiceover inviting you to switch to RACV today. RACV offers a range of insurance products to its members, including also vehicle, motorcycle, caravan, travel, boat, farm and business insurance, and through its finance company provides a suite of car and personal loans, as well as investments.